Price Tip: If you hate negotiating and still want the best possible deal, always price shop online first. 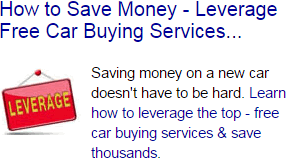 We recommend Car Clearance Deals, MotorTrend, CarsDirect and Edmunds. These free services will offer you the lowest prices on a new Mazda and supply you with multiple competing price quotes. You will know the best price before you visit the dealer. Most people mistakenly believe that the Mazda Invoice Price reflects what the dealer paid for a new vehicle - The true Dealer Cost. It is not! Knowing the dealer cost of a new Mazda gives you needed leverage when it comes time to negotiate a great price. Negotiating from the cost up and not the MSRP down can save you thousands on your next purchase. Do not walk into a new car showroom until you understand the basic terms and definitions you might find on an automobile invoice. This knowledge will help you feel more confident as you negotiate for your next new car like a pro. The MSRP (Manufacturer’s Suggested Retail Price) is simply the list or retail price that auto companies advertise. Savvy car shoppers expect to negotiate so they can pay less than the retail price. This is simply the standard wholesale price for the dealer when they purchase inventory. It might not reflect the actual cost to the dealer. Actual costs might be reduced by holdbacks and dealer incentives. This is an allowance that auto manufacturers give to dealers to cover costs of keeping inventory stocked. It might reduce the actual wholesale price for certain cars. Special consumer incentives, like rebates and upgrades, are offered to help sell cars. These are usually promoted heavily and are fairly easy to find and understand. They may help you save money or get a better car. This is the price that dealers pay to have manufactures ship cars to their lots. This cost is passed on to consumers on the invoice. These are incentives that auto makers pass on their dealers. They may include cash rebates for meeting certain sales goals or promoting stock that has not moved quickly. Auto makers run advertising campaigns to help support their dealers. Each dealer pays to be included, and this cost is passed on to the consumer. Base Mazda Invoice Price + the dealer Invoice price of Options + Destination - Holdback = Total Dealer Cost.